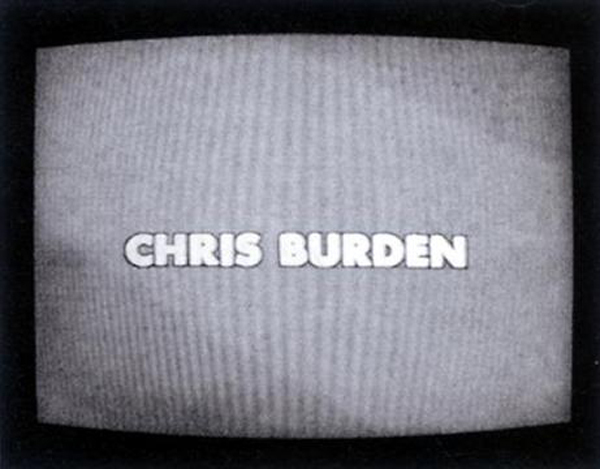 Burden’s first advert, which he refers to as TV ad, was shown five times a week for a month on KHS-Channel 9 in Los Angeles late in 1973. The piece carries Burden’s name and the title Through the Night Softlyfollowed by a brief clip of Burden crawling on his belly over broken glass wearing only a pair of briefs. This is very different to David Hall’s TV Interruptions and Keith Arnatt’s Self-Burial (Television Interference Project). In part this is down to Burden’s use of an advertising slot and the inclusion of credits. Whereas Hall and Arnatt offered baffling interventions into the schedule, Burden is advertising himself and in the process raising questions about both the nature of art and the nature of advertising. In Promo, Burden presents a series of names on screen: Leonardo da Vinci, Michelangelo, Rembrant, Vincent Van Gogh and Pablo Picasso – chosen as being the artists’ names most recognisable to Americans – followed by his own name. In Full Financial Disclosure, Burden references political advertising with the patriotism of the American flag and the disclosure of his financial circumstances. His income for 1976 is shown as $17,210, his expenditure for the same year as $16,156. An artist earning very little from their work? Some things don’t change (once again, Damien Hirst notwithstanding). This entry was posted in Performance, Technology, Television and tagged advertising, art, Chris Burden, Promo, Television Interference, televsion, Through the Night Softly, TV Hijack by Ann Jones. Bookmark the permalink.